← We Are at Southern Manufacturing and Electronics 2017! The 10th National Apprenticeship Week has been taking place since the 6th March and will end on 10th March. Showcasing the importance of both apprenticeships and traineeships for the economy, businesses, and individuals, it highlights their overall positive impact. Celebrating this success are both apprentices and employers from all over England, and hoping to encourage more people to enroll in fast-track apprenticeships. When entering a career in a technical industry, gaining the necessary experience is vital. With degrees not necessarily great as everyone’s method of learning, apprenticeships are a more hands-on approach that ensures skills are learned through working in top companies. Gaining the experience and the qualifications needed to begin a chosen career is made easier especially for younger people, who have more job security and access to better job opportunities. With approximately 53% of male apprentices and 48% of female apprentices so far this year already starting their apprenticeships, it’s clear how young people view apprenticeships as the perfect gateway to a career. Alongside providing people with expert skills, apprenticeships are also vital for companies. Employers wanting to take on young people and helping them to grow their skills in the industry utilise apprenticeships as gateways. Cost effective and efficient, apprenticeships involve employers direct involvement, which aids them in finding and investing in people who are motivated to learn. With the government’s plan to increase the UK’s apprenticeships up to 3 million by 2020, closing the skills gap and ensuring the UK’s high level of competitiveness in the global economy is important. Aiming to be the most successful year for the National Apprenticeship Week, the event reinforces how vital apprenticeships are as the future of technical industries. These industries rely on a highly skilled workforce, which can be made more efficient when employers help young people to develop their skills from the beginning. With apprentices being adaptable, apprenticeships drive people into becoming the employees that companies require. As these talented young people remain in the companies that invest in them, they become more motivated and more productive, which only increases the benefits for the employers. We were invited by West Thames College in Isleworth to participate in their Careers fair, organised by college students with other local schools and local Job Centre attending. Wearing company t-shirts, we set up a recruiting banner and our official video in the background. Our Apprenticeship Scheme was highlighted by our visitors, particularly the ‘whole life career’ and pay scales. Going to West Thames College Careers Fair was a positive experience, as we saw more than 20 visitors interested in engineering and who might submit their CVS for our consideration. 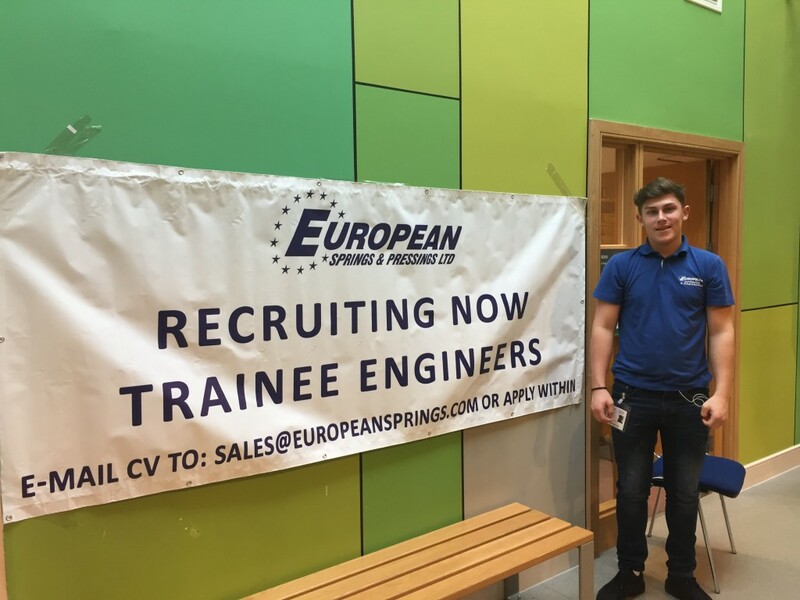 Interest in European Springs and the Apprenticeship Scheme was visible, and we’re always proud to extend our visibility to young people interested in engineering careers. As strong believers in investing in young people, at European Springs all of our springs and wire forms are of the highest quality, with our dedicated and expert team ensuring every detail is perfect. Look through our stock catalogue and let us know what solutions you need – including bespoke solutions!